1) Nation remembered Jawaharlal Nehru on his 124th birth anniversary: Country fondly remembered its first Prime Minister Jawaharlal Nehru on his 124th birth anniversary with President Pranab Mukherjee and Vice President Hamid Ansari leading the country in paying homage to him. 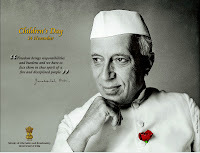 Nehru was born to Motilal Nehru and Swaroop Rani on November 14, 1889, in Allahabad in Uttar Pradesh and his birthday is celebrated as Children's Day in India as he was fond of children. 2) World Diabetes Day observed: World Diabetes Day was observed on 14 November 2013 across the world to raise awareness of diabetes. The theme for period 2009-13 is Education and Prevention. World Diabetes Day is an annual campaign, led by the International Diabetes Federation (IDF) and its member associations. The date was chosen because it marks the birthday of Frederick Banting, who, along with Charles Best, is credited with the discovery of insulin in 1921. 3) Government released postage stamps on Sachin Tendulkar: Union Law Minister Kapil Sibal released commemorative postage stamps to pay tribute to Sachin Tendulkar on 14 November 2013 (Thursday) at Wankhade Stadium, Mumbai before the start of 2nd Cricket Test match between India and West Indies. The 40-year old batting great is only the second person after Mother Teresa to have a stamp released after him, when he is alive. 4) British Prime Minister David Cameron is on official visit to India: Prime Minister Manmohan Singh and British Prime Minister expressed satisfaction that despite the continuing global economic slowdown and the Eurozone difficulties, India-UK trade ties have been resilient. Prime Minister Cameroon arrived in the national capital late Wednesday night and is scheduled to depart from Kolkata late on Thursday night for Colombo to attend the Commonwealth Heads of Governments meet. 5) Prince Charles celebrated 65th birthday in Kerala lake resort: Prince Charles today celebrated his 65th birth day at the famed backwaters resort Kumarakom in the south Indian state Kerala. For Charles, on a visit to India with wife Camilla, the celebrations were on a modest scale at the sylvan settings of the Lake Resort. 6) Chennai lighthouse reopened to public after 22 years: It was a perfect gift for children on Children’s day. The lighthouse on the Marina beach in Chennai was thrown open to public after a gap of 22 years. It was closed following the assassination of former Prime Minister Rajiv Gandhi in 1991. The 45.72 m tall Madras lighthouse was inaugurated in 1977 by the then Union Shipping Minister G.S. Dhillon. 7) Sri Lankan President satisfied over Khurshid’s presence at CHOGM: Sri Lankan President Mahinda Rajapaksa has expressed satisfaction over External Affairs Minister Salman Khurshid attending the CHOGM summit. 8) Volkswagen recalls 2.6 million cars worldwide: Volkswagen on Thursday announced one of the largest recalls in its history, calling 2.6 million cars into its workshops because of problems with lights, transmissions and leaks in their fuel lines. 9) 7 killed, 40 hurt in Volvo bus fire: Even as Volvo Buses continues with its probe into the fire that gutted one of its buses killing 45 people near Mehaboobnagar on October 30, an eerily similar accident near Haveri, Karnataka has killed seven persons and injured 40 early Friday morning. 10) International children’s film festival under way: eighteenth edition of Golden Elephant, the international children’s film festival of India, began in Hyderabad on Thursday, with Bollywood hero Ranbir Kapoor and Tare Zameen Par fame Darsheel Safary participating in a glittering inaugural function at the Telugu Lalitha Kala Thoranam. 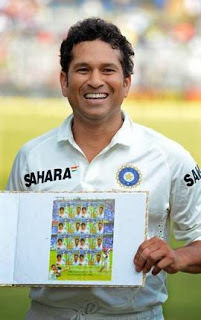 11) Sachin's 200th Test: Tendulkar shines in farewell Test, India in driver’s seat- Iconic batsman Sachin Tendulkar kept his emotions in check and showed his genius for one last time in front of adoring fans with an unbeaten 38 as India seized early control of his 200th and final cricket Test against the West Indies after a disciplined bowling display. 12) Pune girl wins ‘Doodle 4 Google India’ contest: Search giant Google has featured the doodle painted by a class 10 student from Pune, Gayatri Ketharaman, in its home page as a tribute on Children's Day that seeks to represent women's empowerment. The painting, titled 'Sky's The Limit For Indian Women', is the winner of Google's "Doodle 4 Google India 2013 – Celebrating Indian Women" contest. 13) Aviva India unveils pension plan `Aviva Next Innings’: Private life insurer Aviva India has launched a pension plan Aviva Next Innings. In addition to the life cover, the plan offers a guaranteed corpus of 210 per cent of the total premiums paid, upon retirement. 14) PM to inaugurate Mahila Bank on Indira Gandhi’s birthday: Prime Minister Manmohan Singh and UPA Chairperson Sonia Gandhi will inaugurate country’s first all-women Bharatiya Mahila Bank in Mumbai on November 19, the birth anniversary of former Prime Minister Indira Gandhi. Headquartered in Delhi, the bank proposes to have 25 branches by March 31, 2014. 15) INS Vikramaditya set to join Indian Navy on Nov 16: Defence Minister, A.K. Antony, will induct the long-delayed aircraft carrier INS Vikramaditya, designed to boost India’s maritime capabilities, at a shipyard in Russia on Saturday. 16) Malayalam film actor-producer Augustine died in Kozhikode at 56: Malayalam film actor- producer Augustine died at a private hospital in Kozhikode this morning. He was 56. Augustine, who acted in over 100 films, portrayed several characters that remain etched in the memory of film buffs. His major films include Devasuram, Sadayam, Aaram Thampuran, Nandanam, Indian Rupee, Shutter among others.